Get tickets to the Sept 21st Screening from Rush49 for 50% off!! For those of you who don’t know who New Filmmakers LA is…Read below. NewFilmmakers LA at Sunset Gower Studiosis a non-profit 501(c)(3) organization designed to showcase innovative works by emerging filmmakers from around the world, providing the Los Angeles community of entertainment professionals and film goers with a constant surge of monthly screening events. 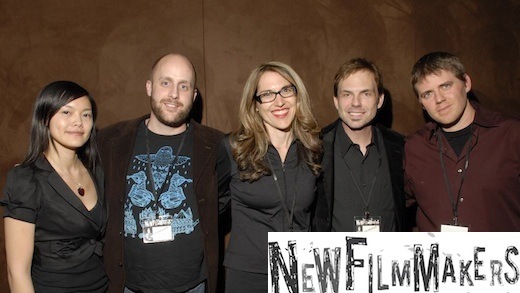 NewFilmmakers LA provides a forum where filmmakers can be recognized for their contributions, have open audience discussions about their projects and connect with industry professionals for insight on distribution, production, acquisition and representation. The NewFilmmakers Series began over ten years ago in New York at the Famous Anthology Film Archives, screening over 500 features, 1600 shorts and is New York’s oldest and leading Screening Series. Many well known films have debuted and been discovered at NewFilmmakers including Too Much Sleep, Zero Day & Blair Witch Project. Each month, NewFilmmakers LA at Sunset Gower Studios will be presenting Red Carpet Screenings of Documentaries, Shorts and Features that have been submitted from all over the world, followed by a Q&A with each director about the film. The Screening Program also offers a special after party so the audience can meet the New Filmmakers and the incredible talent involved. NewFilmmakers LA at Sunset Gower Studios is designed to showcase innovation work by new filmmakers who may (or may not) have been overlooked by other festivals. For the most part this means first and second efforts by filmmakers in the short or feature categories. However, only you can determine whether you are a “new” filmmaker or not, and all submissions are considered and welcome.